Navy veteran Chuck H. was not a fan of the VA Health Care system — until he discovered how well it worked in Boston. Chuck, who lives in tiny Charles Town, W.Va., traveled nearly 500 miles to meet thoracic surgeon Abraham Lebenthal, M.D., at the Boston VA, changing his opinion of medical care and dramatically altering the outlook toward his diagnosis of malignant pleural mesothelioma. It was a trip, taken four times now, that was well worth the journey. As a veteran, he found the specialized, personalized care that he couldn’t find anywhere else. Chuck, whose last name is being withheld over privacy concerns, is a mesothelioma survivor expecting to survive a real long time. Chuck, who served aboard the USS Grand Canyon, the USS Norton Sound and the USS Holder during the Vietnam era, was frustrated by the VA care he had received closer to home in Virginia and then in Washington, D.C. They had no answers for him there. They offered little hope. They struggled for months to even diagnose it correctly, leaving him resigned to the idea that he had just 9 to 12 months to live. He still remembered being badly misdiagnosed almost 45 years ago by various Navy doctors when a kidney shut down, causing him years of pain. It was the same kind of frustration he felt at the local VA three years ago, when knee replacement surgery left him feeling like a neglected number on a medical chart. 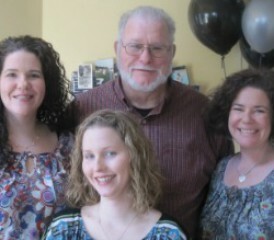 He was wondering if this latest diagnosis was even worth the fight, until his youngest daughter dragged him to Boston. With some help from the Doctor Match program at Asbestos.com, Chuck connected with Lebenthal quickly. “I’m a homebody,” he told Asbestos.com. “I didn’t like the idea of traveling anywhere, especially to Boston. But once I got there, Dr. Lebenthal, and the entire staff — was wonderful. He explained things in simple terms. Chuck today sounds like a man primed to battle cancer, fueled by his family, his future and the confidence he gained by the care he received in Boston. His calendar is booked. Giving up, or giving in, is not an option. He promised youngest daughter Charlene, an emergency room nurse at a nearby hospital, that he will be taking her on an Alaskan cruise — and be around to watch her get married and raise children. He promised everyone he would start driving slower, and stop getting speeding tickets in his 2012 silver Chevy Camaro convertible he bought during his “mid-life crisis” two years ago. “That’s my baby,” he said. He promised his brothers at the Fraternal Order of Eagles, the local community service organization where he works, that he expects to resume his duties as an officer. He promised himself he would start fishing again, maybe go gamble at the Charles Town racetrack, or drive to see those relatives in Ohio that he hasn’t seen for too many years. And of course, there is his home, where he lives with Babe and Sadie, his two dogs, and Kitty the cat. There is grass to cut, rose bushes to clip, a pool to keep clean, and cookouts to host. It has been him and the pets alone ever since his youngest daughter grew up and moved out. “My dad raised me on his own since I was 13 years old,” said Charlene, who lives less than a mile away. “He did a good job, too. He did it all. Chuck spent much of his life as a welder, first in the Navy and then in private industry. He worked with loads of asbestos products, thinking nothing of it, which led to his mesothelioma cancer decades later. He went to Boston first for a consultation, then returned for a biopsy and later for the pleurectomy and decortication surgery earlier this year. As part of his rehabilitation, the staff challenged him to get better, appealing to his determined side, pushing him gently, and pushing all the right buttons. An expected six-week rehab in Boston ended in less than three because he progressed so quickly. The care he received in Boston isn’t too surprising. Lebenthal is a veteran of the Israeli army. He speaks often on the need for special care of U.S. military personnel, particularly those with an asbestos disease likely caused in the service. His expertise in mesothelioma comes from working with renowned surgeon David Sugarbaker, M.D., at nearby Brigham & Women’s Hospital. Lebenthal talked several times with both Chuck and his daughter Charlene before and after surgery, much like he does with other veterans and their families. There is an old-school feel to the care he gives to each case.